Without any suspicion, you enter your bathroom, and OH MY GOD, what is that? Your cat is drinking toilet water! Yuck! Disgust arises as you try to remember if you flushed the last time. 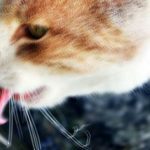 Drinking from the toilet is actually common among household cats, and as you will learn in this article, choosing toilet water over a regular bowl is also a logical choice for cats. The good news is that in this article you will not only learn why your cat drinks from the toilet but several efficient ways to stop it. So, why do cats drink from the toilet? We believe that this behavior is due to several traits. Cats love drinking from running water. It’s instinctive behavior resulting from the fact that in nature, running water is cleaner and less likely to hide danger. Toilet water is fresher than the water inside the cat’s bowl, which, due to lazy human nature, you may have forgotten to refill. There is something else wrong with the water bowl, like it’s in the wrong location or another cat is guarding access to it. Okay, we don’t have to argue whether drinking from the toilet is disgusting. But isn’t it dangerous? If you use automatic toilet disinfectants, it is. If your cat slips and falls into the toilet, it is. Otherwise, it’s just fresh water, assuming that you do flush and keep the WC relatively clean. But can you stop your cat from drinking toilet water? How hard could it be to close the toilet lid? It turns out that it is really hard to remember to close the lid. Even if you learn to do it after every use, there is no guarantee that at some point you’ll forget to close it. Funnily enough, we found automatic toilet seat covers on Amazon.com that lower each time the water is flushed. It’s not like we recommend you try one, but it could be fun. However, closing the lid solves only a part of the problem. The reasons why your cat prefers toilet water over his water bowl still remain. The cat might learn to accept the new situation and force himself to drink from his water bowl, or, he can also stop drinking altogether, and that is begging for dehydration and associated medical problems. As you face the reality that always closing the toilet lid is a utopian desire, you can try to focus more on your cat’s bowl. He has a choice whether to use his bowl or to drink from your toilet. Can you make the first one a better choice? Is the water in your cat’s bowl fresh enough? We already mentioned that the water inside the WC is fresh. Yeah, how often do you replace your cat’s water and how often do you flush? You won’t beat the flushing, but your cat’s drinking water must be changed at least daily or even more frequently if your cat prefers so. Additionally, washing the bowl with dish detergent at least weekly is recommended. 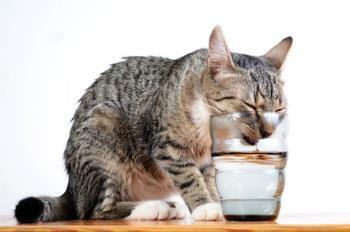 Is your cat’s water bowl easily accessible? If your cat drinks from the toilet, maybe it is easier for him to get there than find the bowl? Where should you place the bowl? Elevated locations, locations near your cat’s favorite spots and pathways, locations in clear view, and probably near your toilet are good guesses. But you can avoid the guessing by simply adding more bowls and spacing them evenly throughout the house. This way, at least a few of them will suit to your cat’s preferences. Having several bowls is even more important if you have multiple cats. Territorial animals, such as cats, are more likely to share water bowls if they are abundant. Also, make sure that the water bowl is not near your cat’s food or litter box. Subconsciously, cats view food as a dead animal, and drinking near a dead animal is not a good choice. As for the litter box, drinking near his toilet is not among your cat’s preferences either. Though, it’s not forbidden to drink from a human toilet, go figure. The type of bowl can also play a significant role for a cat to avoid it. Cats can have individual preferences, but deep and narrow bowls tend to cause problems. To stop a cat from drinking toilet water, you should focus more on his water bowl than the WC. 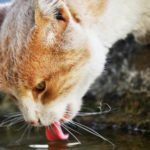 It’s very likely that there is something undesirable about your cat’s current drinking spot, like the water in it is stale or the water is too close to your cat’s litter box. You can learn about different ways to make your cat’s bowl more pleasant here, but in the meantime, try to discipline yourself to close the lid every time you use the toilet. 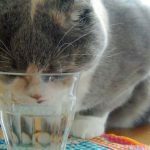 What if your cat is not drinking enough water?